Dental Attrition is the change in your mouth’s vertical dimension from a combination of the mechanical forces created by the opposing teeth on the roof of the mouth and the bottom coming together. This grinding of your teeth can be caused involuntarily by bruxism which often happens during one’s sleep and can even go undetected for years unless others have noticed it. Some methods for stopping this attrition or involuntary erosion of the enamel often include the use night guards for your whole mouth (like a retainer without any pressure on the teeth) or just a small, less visible and less intrusive plastic composite that goes between the contacting surfaces of the larger molar teeth. People with sensitive teeth often have a combination of contributing factors that have worn down their teeth’s enamel layer. Carbonated beverages, sodas, acids (such as vinegar or salad dressings) and anything with lots of sugar in it can lead to the weakening of enamel which is then further eroded by night time grinding. This type of attrition can lead to several teeth requiring attention at the same time rather quickly. 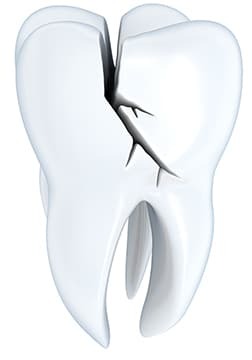 Eventually, the attrition will cause erosion of the enamel, which could lead to fractures and even the potential need for a root canal & installation of a dental crown. Most types of crowns are made of ceramic material, porcelain, gold alloys, or other metal alloys that can be bonded to the existing tooth structure after it is carefully prepared by a prosthodontist. This is a relatively permanent fix and the crowns will feel and look just like (if not better than) the real thing without the pain or sensitivity that can go along with having natural teeth that have worn down to the dentin layer. If you believe you grind your teeth at night, or your dental health is worsening because of dental attrition, give us a call at Carson & Carson, DDS at 1-805-983-0717 or click the button below to contact us to schedule an appointment.